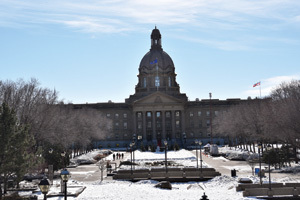 The 2019 Alberta Throne Speech focused on diversity, energy, education, children and health care. Taking place on Monday, March 18, Lieutenant Governor Lois E. Mitchell delivered the legislative tradition that outlines the current governments goals and plans for the next year. Sunny South News editor Nikki Jamieson was in attendance. Mitchell began the speech by highlighting the diversity of the province’s 4.3 million residents, and the difficulties it has faced over the years. While these challenges were overcome and lessons were learned from them, one challenge in particular continued to happen — the boom and bust cycle. Mitchell outlined several steps that the newly elected NDP government had taken to do so, such as banning corporate and union donations, strengthening lobbying laws, reducing politician travel and hospitality expenses by 80 per cent, increasing efforts to diversify boards, agencies and commissions and provide more budgetary information to the public, in order to increase transparency. Steps were also taken to diversify the economy and create jobs, with Mitchell highlighting investments in infrastructure, health care and schools. The speech also pledged that the province would build and repair 4,000 more affordable housing units, invest in water infrastructure to ensure every First Nation in the province has access to safe and reliable drinking water and invest in rural broadband. Energy jobs would be protected, and government would continue to fight to get pipelines built, placing the failure to do so was placed squarely on “successive federal governments”. Citing the country’s support to get oil to tidewater, the government pledged to “keep the pressure on” to get the Trans Mountain Pipeline built. As Alberta’s lack of export capacity is causing an oil backlog, the province had temporarily put a limit on oil production, raising it as the market changes. To help offset the backlog, the province signed an agreement to lease 4,400 railcars to ship oil — enough to ship approximately 120,000 barrels a day — to bring production up and bring the oil curtailment to an end. The province is working on diversifying the economy — both inside and outside the energy sector. The government had put aside $3.5 million for a Made-In-Alberta energy diversification plan that was launched in spring 2018, and from $1 billion In royalty incentives and loan guarantees, Mitchell said they have leveraged nearly $13 billion in new private sector refining and upgrade investments, creating 8,500 new jobs. Other diversification initiatives include cutting the small business tax by a third, providing access to capital during the economic downturn to help businesses hire and expand, introducing tax credits for entrepreneurs and helping the Agrivalue Processing Business Incubator expand. While doing this, Mitchell said they are continuing to maintain Alberta’s $11 billion tax advantage over the next lowest taxed province, and the Conference Board of Canada forecasts a growth of 8.8 per cent for Alberta manufacturers in 2019. Alberta’s Climate Action Plan was also touted during the speech. Health care was a top priority in the speech, with Mitchell highlighting projects across the province that are or have been built. Mitchell announced that the government had met their commitment to build 2,000 long-term and dementia-care spaces, and are continuing to invest and expand health services. Government would seek to strengthen education in the province, and are working to update the curriculum and support classrooms. Additionally, government will seek to further support access to child care, after having introduced a $25-a-day child care pilot program, which has expanded to 7,300 spaces in 122 licensed child-care centres. Mitchell cited in the speech the work that government had done to reduce child poverty across the province, thanks to initiatives such as Alberta Child Benefit, the enhanced Alberta Family Employment Tax Credit, school nutrition programs and increasing the minimum wage. Concluding the speech, Mitchell pledged that government would continue to work to make the province more diversified, modern and resilient.